Installing hardwood flooring is not a small investment. You want to be sure you protect your investment and keep it looking nice for years to come. Installing hardwood flooring is not a small investment. You want to be sure you protect your investment and keep it looking nice for years to come. Choosing the right finish for your hardwood flooring will not only protect it, but enhance the wood’s natural beauty. Here are some tips to help you find the right finish for your hardwood. 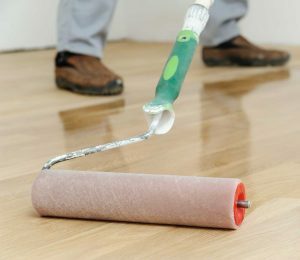 This type of finish combines plasticizers, synthetic resins, and other protective ingredients to give your flooring a finish that is durable and easy to maintain. Recoating is easy and once several coats have been applied, the flooring will have a natural amber glow. It is important to also note that oil-based polyurethane is flammable and tends to take a while to dry. A water-based polyurethane finish will give you a clear, non-yellow coating. It is very durable, noncombustible and more resistant to moisture than an oil-based finish. This type of finish is a great choice for commercial properties because it is exceptionally durable. If you want a finish that dries quickly, is easy to recoat, and will maintain a clear layer of protection for your flooring, then this is the choice for you! If you need a finish that is exceptionally waterproof, consider a solvent-based polyurethane finish that has been moisture-cured. The moisture-curing process depends on the amount of humidity in the air. During this process, the polyurethane absorbs minute moisture particles that harden on the surface as they dry. If you’re considering this type of finish, know that it is difficult to apply and should only be done by a professional. This finish is ideal for areas with a lot of moisture, or where accidental spills are likely to occur. So how do you decide? Think about how you will be using the room, and how you want the floor to look when it’s done. Most of the available options will give you sheen options. Remember, the higher the sheen, the more noticeable scuffs and scratches will be. A less glossy or “satin” finish will give your wood flooring a more natural look. How durable does the finish need to be? Does the floor need special moisture protection? How do you want your hardwood flooring to be treated? This entry was posted on Friday, July 14th, 2017 at 4:10 pm. Both comments and pings are currently closed.